I live with anxiety and depression. I’m not alone in this with 1 in 4 people experiencing a mental health problem each year. I regularly feel like getting out of bed is an insurmountable task, that I’m drowning in the weight of my failings and that life is hopeless. Sometimes the world is so scary, so fraught with risk, that I’m not sure I can keep myself safe. 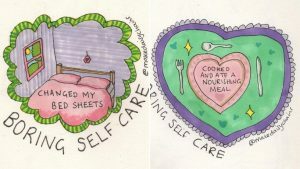 When I’m in a particularly low ebb, it can feel like I won’t ever get better and I rely on self care to get me through the day, and maintain some amount of wellbeing for other days. Self care is a difficult, but essential, part of recovery for a lot of people. It isn’t glamorous or hashtag Instagram worthy for the most part. It’s doing the basic things you need to do to survive, and hopefully thrive at some point. It’s getting out of bed, showering, sticking to a treatment plan that works for you (be that therapy or medication or a combination of both), working towards good sleep hygiene, cooking and eating something nutritious, exercising in a way you can and paying your bills. A lot of this might seem pretty easy to a well person, but it’s not. It can be hard but it’s necessary. Self care has become a huge trend on social media, in fact this week is #selfcareweek. Your social timelines are likely to be filled with pictures of people practicing self care, though it might not look like what I just described. Self care has been utilised by brands and influencers who have everything you need to be better…at a price. There is no shortage of companies willing to exploit illness to sell their bath bombs, face masks, cosy blankets and scented candles. Don’t get me wrong, I love all of those things, what I don’t love is that self care is being redefined to be about expensive pampering sessions and products that aren’t going to have the impact they claim. To get a real idea of the problem, let’s look at some of those products, shall we? Goop have a ‘Self Care for the Cubicle-Bound’ kit which promises to “sharpen your wits, improve your mood, and liven up your skin”, for a hefty price tag of £380. If that is too much for you to invest, don’t worry, the combination of “potent, miracle” face oil, cuticle cream, lipstick and dental floss probably wasn’t going to be all that helpful anyway. For the much lower cost of £25.99 you could purchase an Anxiety Kit, but it’s contents of an aromatherapy roller, positive thinking deck and healing crystal are no less problematic. If a subscription is more your thing, you could pay £38.00 monthly to receive a WILDWOMAN box which claims to be able to make you “live the life you truly desire and deserve” through a book, stationary, crystals and sweet treats. As well as hawking chocolates, pretty stationary and beauty products, most of these packages also include the usual pseudoscience culprits. 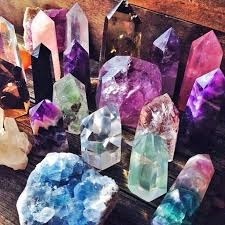 Crystals feature heavily, which makes sense because those who endorse crystals claim they support and heal your body, and can be used in many ways including wearing in a locket, rolling on your face and even inserting inside yourself. However, there remains no scientific evidence that crystals are useful at all. Similarly, aromatherapy products are included in a lot of these self care kits despite there being very little evidence for all the claims made by aromatherapists regarding the various healing properties of oils. With all of that considered, you could be setting yourself back hundreds of pounds to receive a whole heap of nothing useful, and potentially end up feeling worse that it hasn’t worked when you were promised that it would. If having a bubble bath or taking a nap under a fluffy blanket makes you feel better, great, do that. Taking time to enjoy small pleasures is definitely an aspect of self care, but it isn’t the whole story. Mental health conditions are never going to be cured by having a dewy complexion or wearing a necklace with a phrase of affirmation on it. It’s important we don’t accept that potentially vulnerable people are being peddled luxury (and mostly useless) products in the name of self care. Commodifying recovery isn’t okay and it shouldn’t be a trend we allow to go unchallenged. 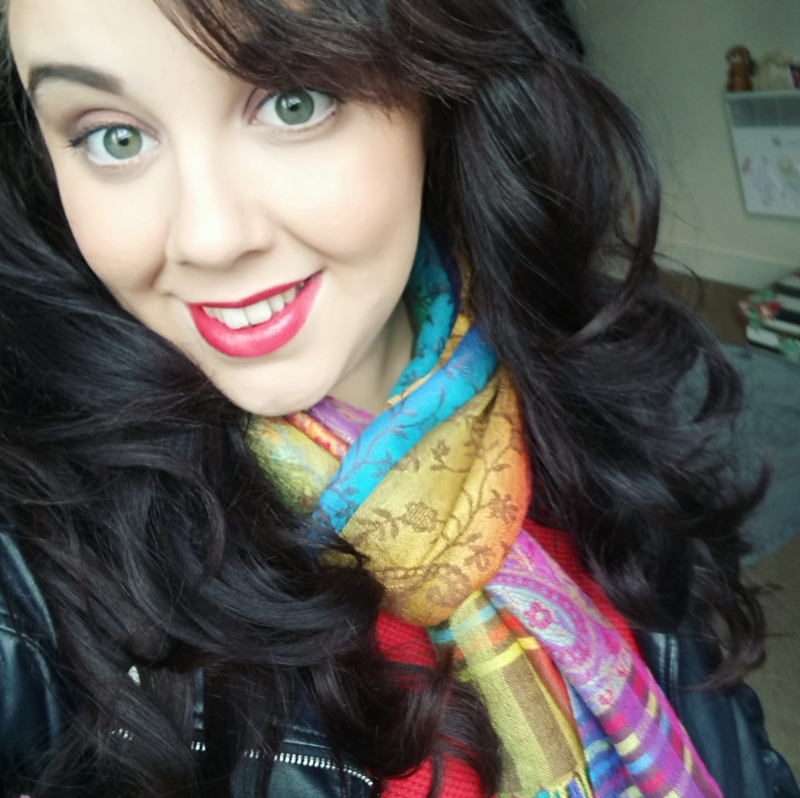 Christina is a Communications and Fundraising Manager for a dementia carers charity, and Trustee for a women’s refugee and asylum seeker charity. With over a decade of experience in the third sector, and a specialism in campaigns, capacity building and social impact, Christina has worked internationally on issues like global health, hunger, and wealth inequality. In her spare time she’s an avid bad dancing doer, board game player, city break haver and tea drinker. You can find her on Twitter and Instagram @ChrissieBM for political ramblings, mental health honesty and far too many selfies. This entry was posted on November 16, 2018, 12:39 and is filed under Depression and anxiety, mental health, Pseudoscience, Public Health, science, Skepticism. You can follow any responses to this entry through RSS 2.0. You can skip to the end and leave a response. Pinging is currently not allowed.